Tyson Vick of Steampunkmonsters.com used Worbla for his breastplate and shared the process with us. A while back I used Worbla for the first time while working on my Genie, and now, with a better understanding, I use it again to create a light-weight, metallic looking piece of armor! 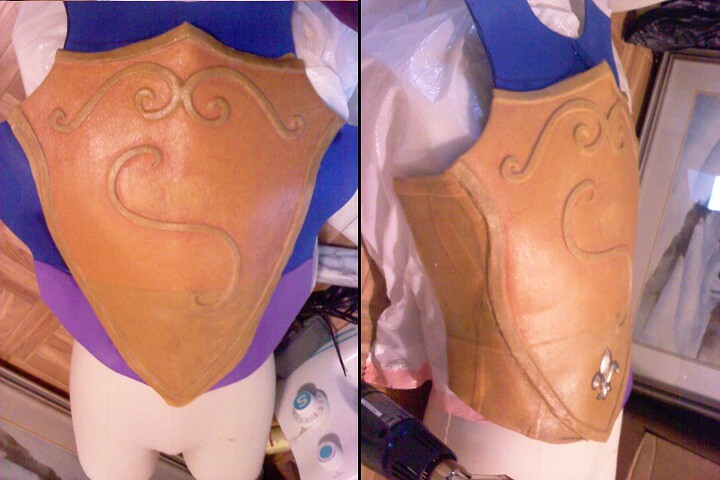 This is the Worbla Breastplate I made for Percy. I had quite a few scraps left over from the Genie, as well as one piece of warped Worbla that was stored too close to the oven. Using a rolling pin, I ironed out the warped piece by heating it up and flattening it while warm on a hard surface. 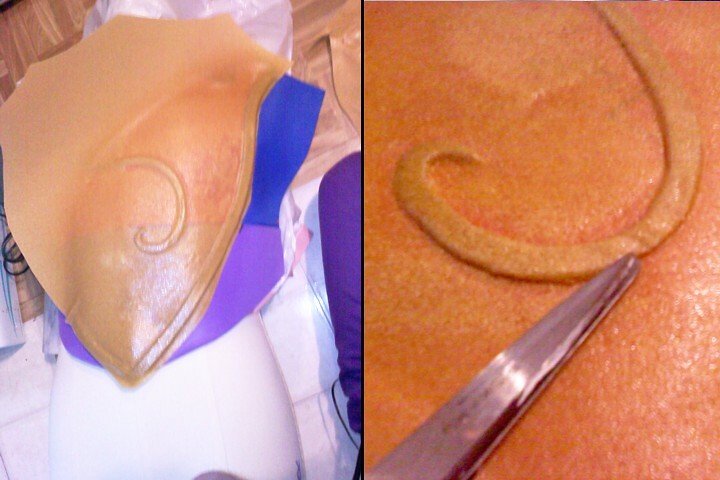 Worbla works best when heated to a consistency that reminds me of a fruit roll-up. Too hot and it starts to look gravely of frothy, and too cool and it won’t stick. Interestingly, this is not a difficult product to use, and finding that correct temperature comes very quickly, and since the change is apparent visually, it’s easy to reproduce once you find it. I had some warped worbla which sat too close to the oven. I used a rolling pin to flatten it. I also took all my scraps, heated them, and using the rolling pin, fused and flattened them together into a workable sheet. I fused all my scrap pieces together and rolled them flat. With this project, I decided to use a craft foam base. I altered a shirt pattern to be just the front and side panels, and cut it out of foam. I glued the front opening shut, by overlapping the two sides of foam. A curved point formed at the top. The curved point just below the neck was actually in the pattern, and I believe the original shirt is not meant to button all the way up. I also made an equally proportioned shield shape for an overlay. I traced it onto butcher paper/waxed paper. I also mapped out where I wanted my swirl details to go. I altered a shirt pattern and made a shield pattern for the overlay. I made a craft foam base. I cut out the shield using another layer of craft foam (red), and glued it to the other piece. 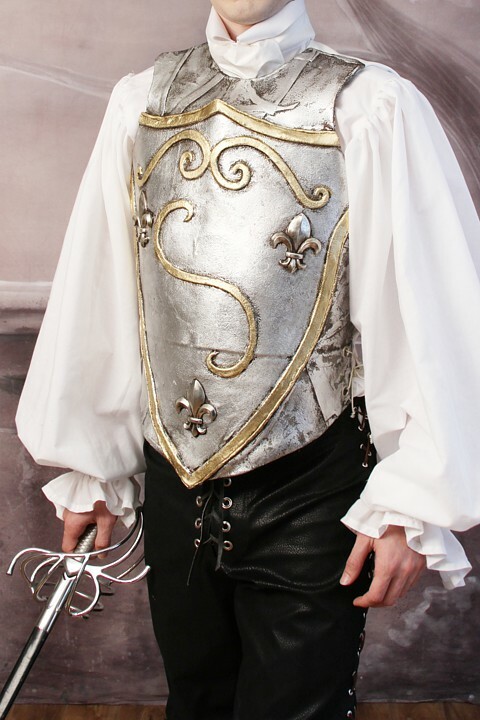 Notice how the shield sticks up at the point below the collar. It hides the bump, and gives a 3D effect. I cut out and attached the overlay using craft foam sheets. I also cut the details out of craft foam and glued them into place. 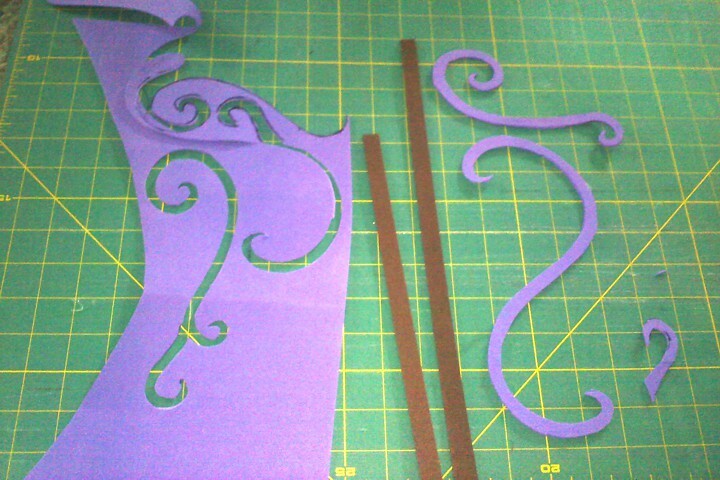 I cut out craft foam details. 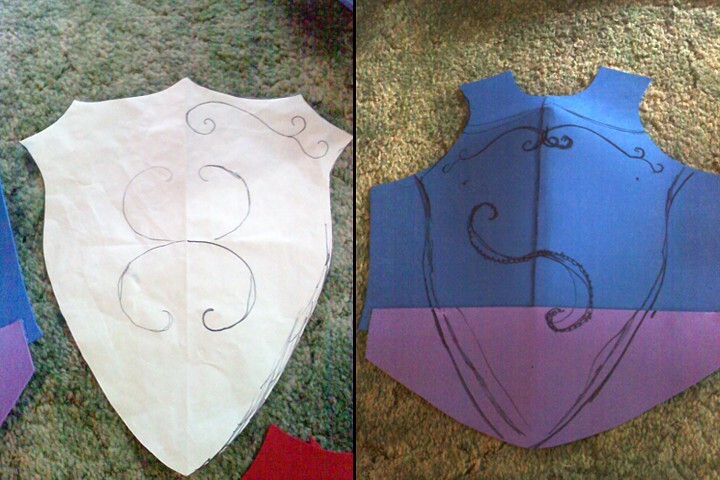 Next I took a large solid sheet of Worbla to cover the shield portion of the armor. I have been following Cosplay artist Ameno Kitarou on Facebook, and he gives many tutorial using Worbla, and I tried one of his techniques. The raised detailing was something I did not consider on the genie, though I think it would have worked better than what I chose to do. I tried the technique he mentioned of covering the details and using a pointed edge (like scissors) to press the worbla around the edges of the curved foam details. When finished, the effect looks much more realistic and metallic. I heated a sheet of worbla over the craft foam and using the scissor edge, formed the warm worbla over the craft foam details. Once the shield and it’s details were covered, I took my fused worbla scrap sheets and covered the side of the armor using it. You may not be able to tell, but I am heating the worbla over the craft foam while it is on my male mannequin torso. This is how I got it to curve correctly to manly proportions. 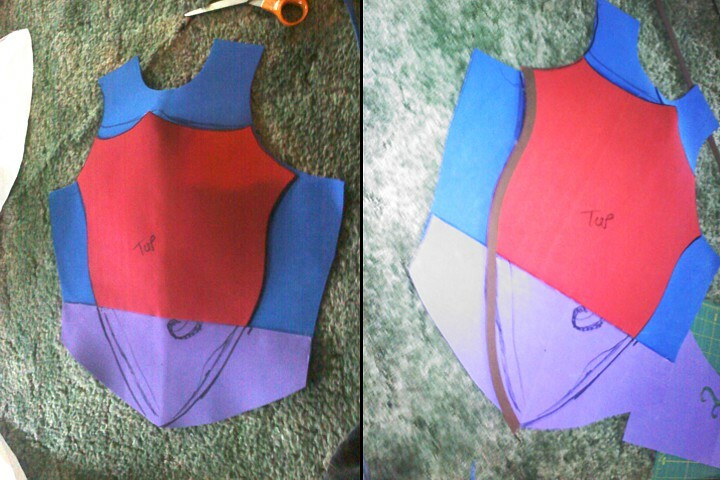 I used the fused scraps on the sides and shoulders of the breastplate. 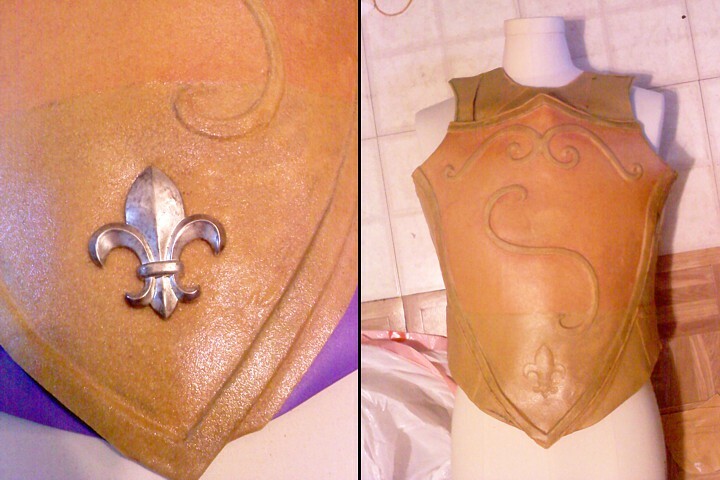 I also heated the worbla to place my metal fleur-de-lis findings. This put a permanent etched mark into the worbla. I used this mark to find and glue the piece in the correct place easily after painting. 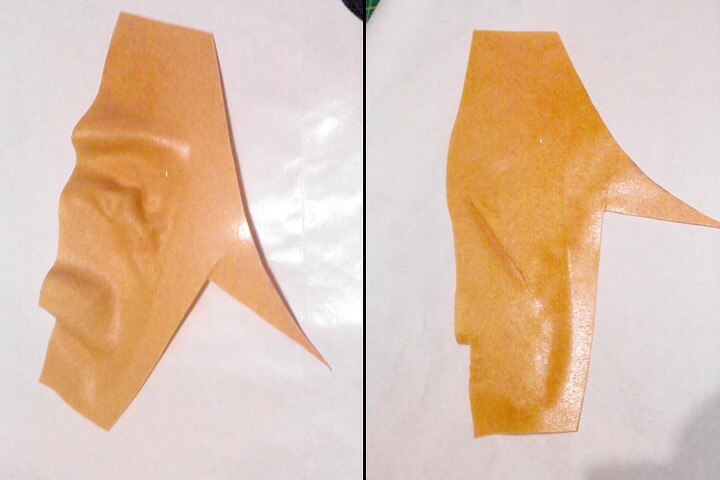 I also pressed my findings into the worbla while hot, so there would be a ridge for attaching later. 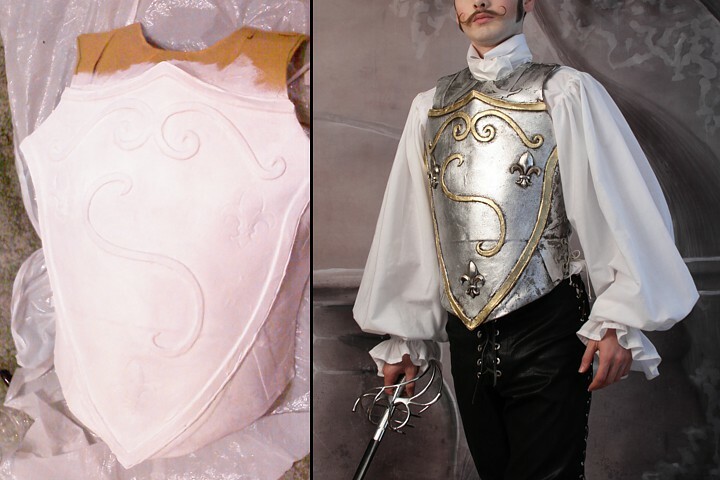 Once the breastplate was heated and curved to my liking, I primed it with Gesso, then painted it silver, and added metal leafing as per usual. I wanted the armor to have more of a forged-on-the-fly aesthetic which will become clear when you read the book, which is why I wanted it to look like it was made from scrap metal. I primed the whole thing with gesso then painted and metal leafed it. To finish, I used the same shirt pattern that I altered at the beginning, and using its back panel, I cut out some white vinyl. 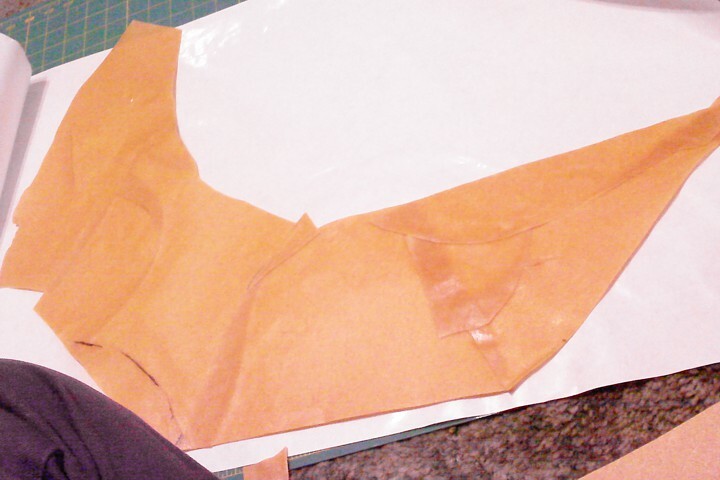 This Vinyl velcros to the underside of the upper shoulder part of the worbla, and then laces up the side using eyelets. My pictures seemed to drop off towards the end of working on this project, which is why everything from priming to finished project is missing, but I only had two days to make this, and felt my time was better spent working. But I hope the worbla portion is well covered in case somebody else wants to try these techniques! Thanks again to Tyson Vick of Steampunkmonsters.com!